You know Summer's arrived when you keep getting told off for having too many bikini pictures on Instagram, but it's that time of year and I've been having an amazing time in Ibiza dancing with Superfoxx and JD at Ocean Beach Ibiza. This one was so fun, as we flew out with loads of DJs, dancers, photographers and influencers to have an amazing time experiencing the best of Ibiza. After a crazy early morning flight, (will never get used to 2am pick up times!) we settled into the Ocean Beach hotel and we were still early enough to catch breakfast, which if you know me, you'll know is the main reason I embark on these opportunities. LOL. 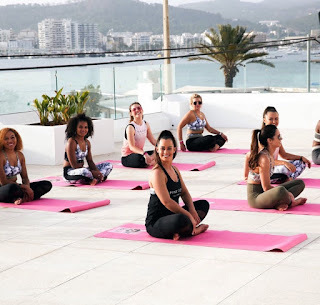 We had a really relaxing day off reading by the pool and then finished the evening with a rooftop yoga class while watching the sunset over the sea, which was so perfect before settling down in the hotel room with a cup of green tea. Wild. On the day of the event, we spent the night dancing away for the incredible DJ, KrystalRoxx in these amazing bikinis from Fila and my new absolute favourite pair of trainers. 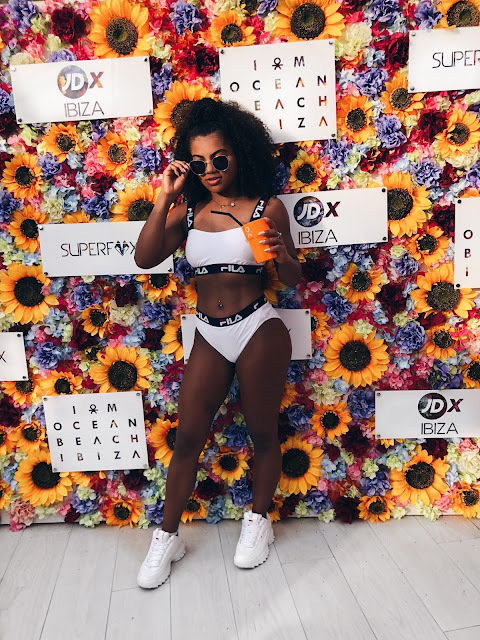 The vibe in Ibiza was absolutely incredible and it's so easy to see why it's one of the worlds best party destinations and so glad I got to experience a party at Ocean Beach Ibiza but from a stage looking out into the a crowd of people having the best time. I've posted loads of photos on my instagram @phoeberaye so go give a follow and make sure you subscribe to be the first to read new blog posts.